I am so excited to share with you my delicious, refined sugar-free and gluten-free Hot Cross Buns. These delicious treats that smell and taste amazing, and will quickly put you in a festive mood. Without the guilt of course! Just because you’re on a mission to get lean and mean doesn’t mean you don’t get to enjoy the holiday season – yes, in this case you can have your cake and eat it too. This Healthy Hot Cross Bun recipe is full of healthy fats, fibre and hormone-balancing nutrients like Maca and will leave you feeling light and healthy inside and out. Unlike traditional Hot Cross Buns made with refined flour and sugar, this healthy variety is based on ingredients like LSA meal, psyllium husk, low fructose rice malt syrup and coconut flour. LSA meal is high in fibre and protein and provides you with a healthy does of omega-3 fats to keep your heart healthy and promote brain function. LSA meal keeps your blood sugar levels balanced and helps curb your sugar cravings too. Despite giving the Hot Cross Buns a delicious, nutty flavour, LSA mix helps in regulating cholesterol levels and helps to detoxify your liver. I used a muffin to prepare these buns, therefore they are more like Hot Cross Muffins, but if you prefer a traditional look, you can form golf size dough balls, place them within close to each other and bake them on a cookie tray. However, I like to make thing quick and easy, so I used a muffin tin. 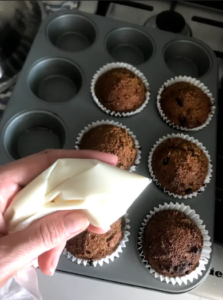 Preheat your oven to 180 degrees Celsius (350 degrees Fahrenheit) and line 10 muffins tins with 10 paper muffin cases. 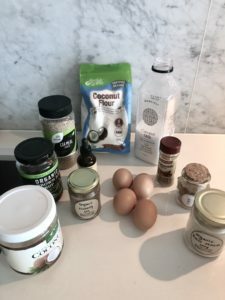 Combine the LSA mix, psyllium husk, coconut flour, baking soda, maca, cinnamon and nutmeg in a large bowl. Next, in a separate bowl, combine the whisked eggs, almond milk, coconut oil and rice malt syrup and then, add to the dry ingredients. Divide the mixture evenly into the muffin cases and smooth the tops with the back of a spoon. To make the crosses, melt the coconut butter, and place it in a ziploc bag. Cut one of the corners and use it as a piping bag to draw a cross on the top of each bun. Place them in the fridge for 10 minutes to let the icing solidify.